The set arrived when scheduled. My daughter and I Absolutely Love this set! It’s perfect for her new apartment off campus. It’s more of a off-white in color. The set is worth every cent. I wish I had known of this company when our children were growing up. Enjoy the crisp look of clean white bedding without worrying about the stains of everyday life with this six-piece duvet set. The fabric is incredibly easy to clean, keeping the white color fresh and bright. 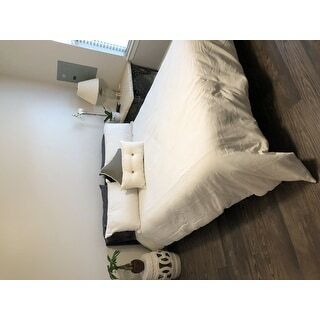 The set includes one duvet cover, two pillow shams (one in twin set), and one comforter inset. The down alternative fill is made from recycled plastic bottles, for a luxuriously soft and eco-friendly material. Purchased this for my master bedroom. My husband is so very picky and he loves it. It is large first ( King) so actually hangs over the sides which some duvets do not. The additional pillow are such a nice tweed, I went back and bought 4 more. 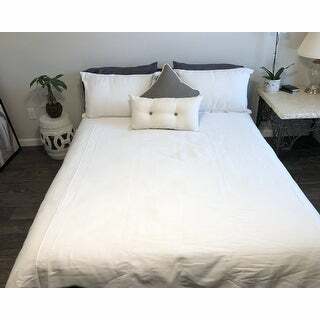 I get a ton of compliments and have sent to others who want to purchase - if you like the look in hotel rooms with a bright white this set is for you and you will buy more of the pillows- now I just have to find that matching blanket! This duvet is cream/taupe not the bright white as shown. Great quality. Really heavy, would be awesome for winters in a cold state. "Is the white fabric a 'soft white' or a bright one? Many Thanks!" "How do I get the other pillows"